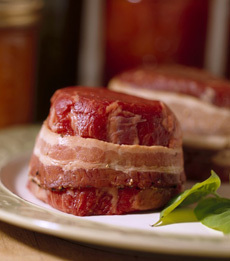 Grass-fed beef: a Certified Angus® tenderloin, larded with a strip of bacon. Photo courtesy of RockyMountainSteaks.com. The different types of beef cuts. 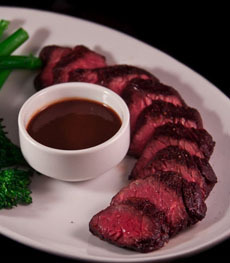 This page addresses terms such as filet mignon, flank steak, flatiron steak, grass-fed beef, hanger steak and others. 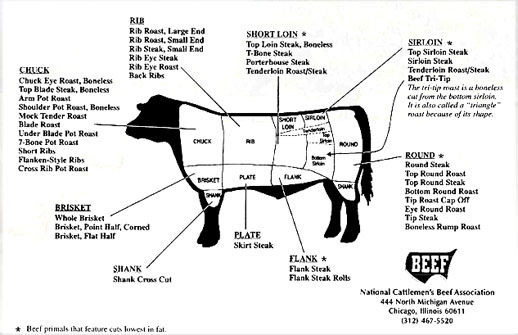 When looking up cuts of meat, it’s helpful to refer to the beef cut diagram, courtesy of the National Cattleman’s Beef Association. If you enjoy this Beef Glossary, we have a food glossary for almost every category of food. The most expensive cut of beef comes from the small end of the tenderloin, and accounts for less than 1% of the entire carcass. Boneless, it is ideally 2-1/2 inches thick (although it is sliced thinner) and 1-1/2 to 3 inches in diameter. The tenderloin runs across the back of the steer. Because this area of the animal is not weight-bearing, the connective tissue is not toughened by exercise. This results in extremely tender meat, the most tender of all beef cuts. It is lightly marbled and mild flavored compared to other cuts, and is best served rare to medium rare. 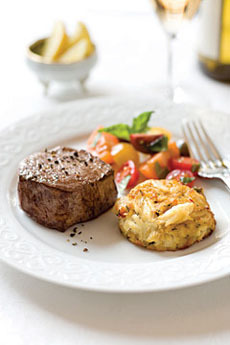 The term “filet mignon” is a French derivative, the literal meaning is small (mignon) boneless meat (filet). On restaurant menus it is called filet mignon, tournedos, medallions, filet de boeuf and tenderloin steak; in the U.K. it is called fillet steak. Chateaubriand is the center, thickest cut from the tenderloin, and a specific preparation. Scroll down to the end of this article for filet mignon trivia and what it‘s called in different countries. Montana Legend filet mignon.Angus cattle receive humane treatment, open grazing in fields of alfalfa, no hormones or antibiotics. Available at Mackenzie Ltd. The long, triangular-shaped muscle from the fibrous underside of a flank of beef. A traditional preparation is marinated, broiled rare and sliced thin against the grain of the beef (London Broil is a misnomer, as the dish did not originate in London). Flank steaks, along with sirloin steaks, have a robust, beefy flavor, but they are substantially tougher. Thus, they are generally marinated or cooked using a moist method such as braising. They also can be rolled and stuffed, then baked in the oven or cooked in a crock pot. See London broil. The flank cut is wide, affording long strips of beef. 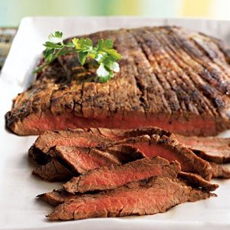 London broil available from Amazon.com. A relatively new cut from the shoulder, a major barrier to prior enjoyment was the large band of connective tissue running down the center of the steak. This led people to assume that the cut in general must be tough. Removing the connective tissue leads to a steak that is often described as having both the tenderness of a rib eye or strip steak while still having the earthy flavor of a sirloin or skirt steak. Most people marinate the cut. The discoloration and dehydration of the flesh in freezer-stored meats. This is due to the loss of moisture and oxidation (resulting from exposure to air). A sophisticated and elegant presentation where the meat is removed from the bottom portion of the bone. 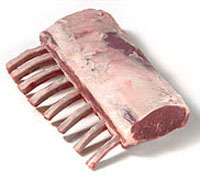 It makes a roast, such the rack of lamb shown here, easier to carve as well. Another example of a frenched bone is the cowboy steak. Rack of lamb available at Lobels.com. Photo © Lobels.com. A USDA designation that indicates quality or yield of meat. See quality grading and yield grading. A grass fed cow consumes only mother’s milk and herbaceous plants during it’s entire life. This natural diet of grass creates beef that is leaner and healthier. See the larger discussion below. 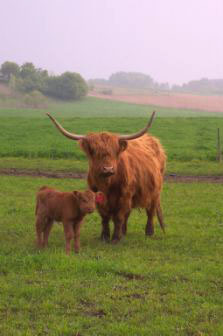 To be certified by the American Grass fed Association (AGA), the animal must not be given any antibiotics or hormones. 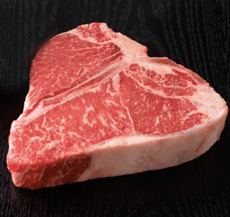 The marbling in a Prime porterhouse steak is one of the factors in grading. Photo courtesy AllenBrothers.com. This term refers to pastured animals that are given a grain diet in the months before slaughter to provide more marbling. This beef cannot be certified by the American Grass fed Association (see entry above). A grass fed cow consumes only mother’s milk and herbaceous plants during it’s entire life. This natural diet of grass creates beef that is leaner and healthier. See the larger discussion in the entry below. To be certified by the American Grass fed Association (AGA), the animal must not be given any antibiotics or hormones. Before World War II, virtually all cattle grazed on grass. Postwar agribusiness, aided by federal subsidies, produced huge surpluses of corn, which found its way into animal feed and led to today’s feed lot cattle production (see The Meatrix). Grass fed cattle are free-range, pastured animals that graze on grass for most of the year, except during the cold winter months, when they are fed hay. 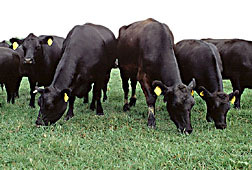 Photo of grass-fed Angus cattle by Scott Bauer | U.S. Agricultural Research Service. While some grass-fed cattle are fed grain during the winter months (better animals are corn-fed, lesser animals eat cheaper feed mixes), the American Grass fed Association (AGA) is working to standardize the U.S. Department of Agriculture (USDA) guidelines for labeling meat. Their definition of grass-fed is “those food products from animals that have eaten nothing but their mother’s milk and fresh grass or grass-type hay from birth to harvest—all all their lives.” The issue is currently further complicated in that some breeders supplement grain with grass or hay year-round, and some meat is labeled “pasture raised,” that comes from animals that are not strictly grass-fed. Yet other animals are raised on grass yet finished with grain (i.e., fed a grain diet in the months prior to harvesting). So, standards are needed so consumers know what they are buying. 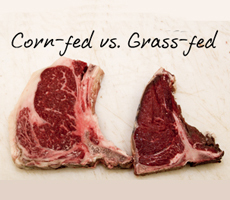 The type of feed has an impact on the flavor of the meat: Grass-fed beef looks, smells and tastes slightly different from grain-fed beef, which has a nuttier taste from the animal’s corn diet. Grass-fed beef is healthier: It has about half the saturated fat of grain-fed beef and therefore is lower in calories and cholesterol. It also is higher in vitamin A, conjugated linoleic acid (CLA, a potent anti-carcinogen) and omega-3 fatty acids (grain-fed beef has none). On the down side, grass-fed beef is more expensive; the animals take longer to come to maturity. Photo courtesy Holistic Wellness Network. Because it is leaner, grass-fed beef needs to be cooked more carefully. Less fat also means less marbling, so it is downgraded by USDA beef grading standards, which work in favor of marbling. This is beef that has been ground or finely chopped. That which is labeled generic “ground beef” or “hamburger” is generally the trimmings of the cheapest cuts, such as brisket and shank. These cuts can be up to 30% fat, which will have the greatest shrinkage. The next level up is ground chuck at 15% to 20% fat, generally considered to be the best balance of flavor and shrinkage. The leanest meats, ground round or sirloin, are best eaten rare or medium rare because they don’t have enough fat content to keep from drying out with further cooking. 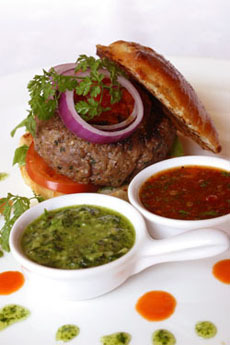 Ground beef is used for meatballs, meat loaf, meat sauces, hamburger and other dishes. By the way, hamburger was popular among the Russian Tartars, who shredded the tougher cuts of beef and gave us the name for Steak Tartare. They introduced the dish to Germany before the 14th century. See our 40+ hamburger recipes. Photo of burger by Craig Holmes | BSP. The Germans added spices and the dish, served both cooked and raw, became popular among people of limited means. In Hamburg, it became known as “Hamburg steak,” and came to the U.S. in the 1880s with the German immigration, where it became a “hamburger steak” and finally a “hamburger.” It also traveled to England, where Dr. J. H. Salisbury, a hearty beef eater, championed the shredding of all foods to improve digestibility (see Salisbury steak). The arrival of the bun is not known for certain, although by the 1904 World’s Fair in St. Louis, the hamburger was already a sandwich. Louis’ Lunch in New Haven claims to have served up the original burger in the U.S. in 1900, putting a beef patty, tomato, onion, and cheese between two slices of toasted white bread—no ketchup or mustard. They still serve it the same way. A cut from near the center of the diaphragm, hanger steak is flavorful and very tender towards the edges, but sinewy in the middle. 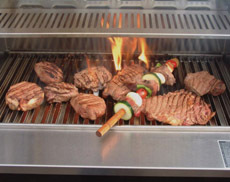 It is best marinated and grilled or broiled, and served rare or medium-rare to avoid toughness. It’s called hanger because it “hangs” independently from the diaphragm of the steer, between the rib and the loin—it is not connected to bone. It is a supportive muscle rather than an active muscle; thus it is more tender than, for example, thigh or leg meat, giving it the nickname “hanging tender.” There is only one hanger steak per animal and the entire cut typically weighs just 1 to 1.5 pounds. It is also known as “butcher’s steak” because butchers would often keep it for themselves rather than offer it for sale. In France it is called onglet, in Italian lombatello, and in Spanish solomillo de pulmon. In the United States, it has only recently become popular; formerly, it was not separated as an individual cut but sold as part of the flank. Hanger steak. Photo © Lobels.com. The results of a decade-long study of 500,000 Americans was published in the March 23, 2009 issue of The Archives of Internal Medicine. The participants were men and women ages 50 to 71 in a National Institutes of Health-AARP Diet and Health Study. According to a review by Jane E. Brody in the April 28, 2009 issue of The New York Times (p. D7), the study found that, other things being equal, men and women who consumed the most red meat and processed meat (such as hot dogs) were likely to die sooner, especially from the two leading U.S. killers, heart disease and cancer, than people who consumed much smaller quantities of red meat. The study suggests that people who consume a lot of red meat should eat a hamburger once or twice a week instead of every day, a small steak once a week instead of every other day and a hot dog every six weeks instead of once a week. Red meat should be replaced by poultry and fish. These foods contain less saturated fat than red meat, and fish contains omega-3 fatty acids that have been linked in several large studies to heart benefits. In addition, according to Dr. Barry Popkin, one of the editors of the report, a reduced dependence on livestock for food could help save the planet from the ravaging effects of environmental pollution, global warming and the depletion of potable water. Livestock production accounts for 55% of the erosion process, 37% of pesticides applied, 50% of antibiotics consumed and 1/3 of total discharge of nitrogen and phosphorus to surface water. Beef from purebred and cross-bred livestock from rare and endangered species. The steers are raised on open pastures on family farms. For more information, visit HeritageFoodsUSA.com, a company that was formed to save heritage breeds by serving as a conduit between small farms and consumers and wholesale accounts. Each grade of beef represents a level of quality. High quality indicates that the beef has characteristics that indicate maximum palatability for the consumer (flavor and tenderness). Not your everyday cattle: Fountain Prairie Highland beef, a heritage breed raised on a the Priske family farm in Wisconsin. A more acceptable name for yak. Yaks are Tibetan cattle, native to the Himalayan Mountains of Tibet. The yak is more environmentally friendly than cattle and easier to handle than bison, but Americans don’t understand “yak meat”; hence, the more food-friendly name. Yaks need far less food than either bison or cattle. To gain one pound, yaks need 6 pounds of forage, compared to 8 pounds for cattle and 12 for bison. Put a yak on the barbie! Photo courtesy FossilFarms.com. Yak meat is leaner than steer: It is 95%–97% lean. Grass-fed without hormones or antibiotics, yak is also low in palmitic acid (which causes bad cholesterol)—it has about 20% that of beef. The red meat is sweet and delicately flavored like bison. It is ranch raised and never gamey.